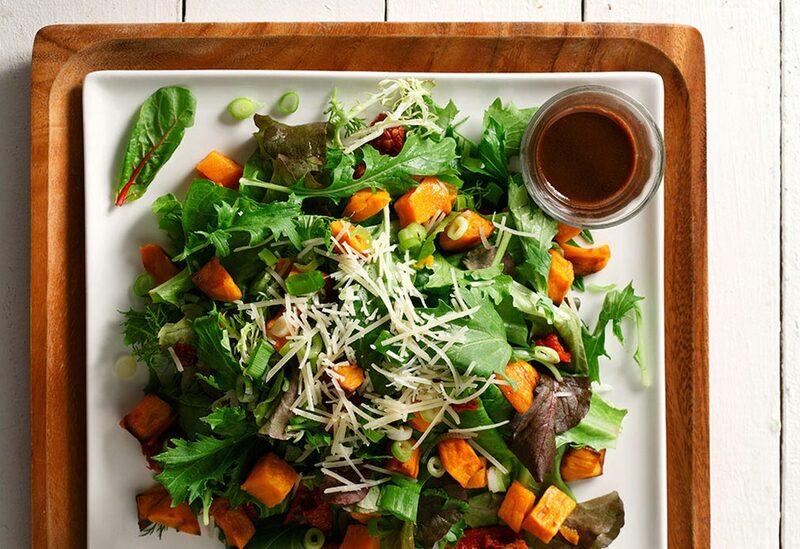 Peppery arugula and sweet-spicy glazed butternut squash bring lively contrasts to this colorful winter salad. Canola oil’s light texture and neutral flavor make it an excellent base for the glaze, allowing the chipotle chile and maple syrup to shine through. 1. Preheat oven to 400 °F (200 °C). Line baking tray with parchment and place whole garlic heads on tray. Set aside. 2. In bowl, combine butternut squash with canola oil, chipotle chile, salt and black pepper. Add pumpkin mixture to parchment-lined baking tray. Keep garlic separate. Bake, stirring squash now and then, until butternut squash softens, about 30 minutes. 3. Remove tray from oven and remove garlic only. Set aside to cool. Gently stir in 1 Tbsp (15 mL) maple syrup to coat squash. Place squash back in oven and continue cooking until glaze forms on squash, about 15 minutes. 4. Meanwhile, in sauté pan, lightly toast pumpkin seeds. Set aside to cool. 5. To make arugula salad, peel off skins from garlic heads and squeeze out roasted cloves. In bowl, crush roasted garlic cloves. Add lemon juice, canola oil, mustard, 1 Tbsp (15 mL) maple syrup, salt and black pepper. Add arugula. Toss. 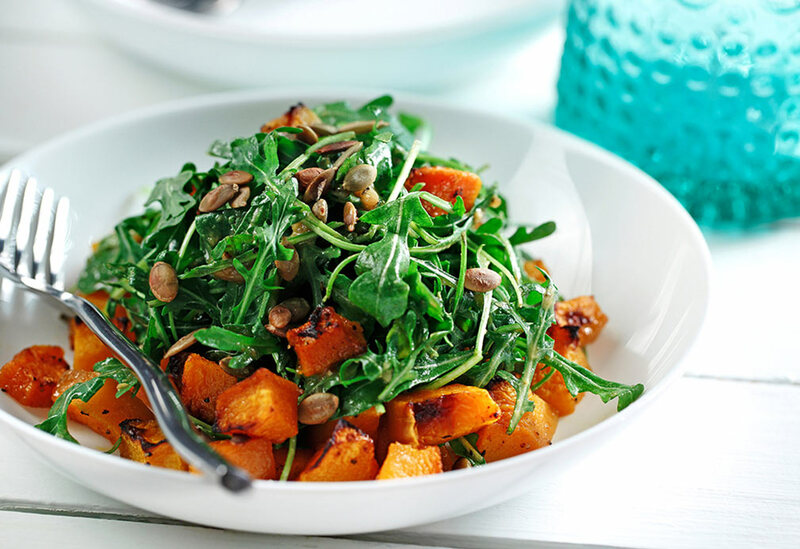 Top with glazed butternut squash and garnish with pumpkin seeds. Serve immediately.